Tom Stafford provides a very clear view of what might be if we take advantage of the Moon's potentials [Stafford, 1991]. 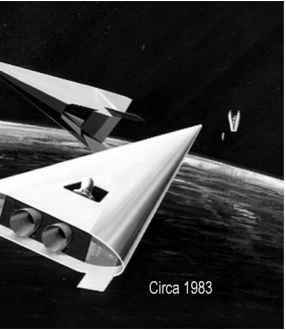 Stafford's synthesis group, in defining the Space Exploration Initiative, placed significant emphasis on the utilization of the Moon as an orbital operational base. Stafford's report goes into significant detail on how this could be accomplished, beginning with a reconstituted, and with upgraded electronics, Saturn V/Apollo program. In discussing the finding with General Stafford at the 1991 Paris Air Show, he related the frustration in the inability of industry to manufacture the Saturn V hardware, especially the Pratt & Whitney J-2 hydrogen/ oxygen rocket engine and the Rocketdyne one-million-pound thrust F-1 rocket engine. It was apparent that the human machining and tooling skills had disappeared with the ageing and retiring of skilled craftsmen, and because the computer-controlled machining was not an adequate substitute. Thirty years after the Apollo missions, with all of the technology improvements, the 1960s hardware capability could not be reconstituted. What was thought impossible prior to the Apollo missions now is impossible because the only operational crewed vehicle we have, the Space Shuttle, is incapable of anything approaching a lunar mission. If we are to take advantage of the Moon as an orbital station it must be with new launcher hardware capable of a lunar mission. President G.W. Bush's Space Exploration Initiative is contained in the Constellation program consisting of the Ares I and Ares V launch vehicles, the Orion crew vehicle and the Altair Lunar Lander. It is unclear whether the Constellation program has as one of its goals to sustain a space presence with frequent flights rather than a few short visits.